When Marcella Raines’ twin brother dies, she honors his request to be buried at sea, never expecting the violent storm that swamps her boat. Though she’s gravely injured–and still emotionally damaged from her recent divorce–Ella fights to survive. Zephyros Martius is the Supreme God of the West Wind and Spring, but being the strongest Anemoi hasn’t protected him from betrayal and loss. Worse, he’s sure his brother Eurus is behind it. 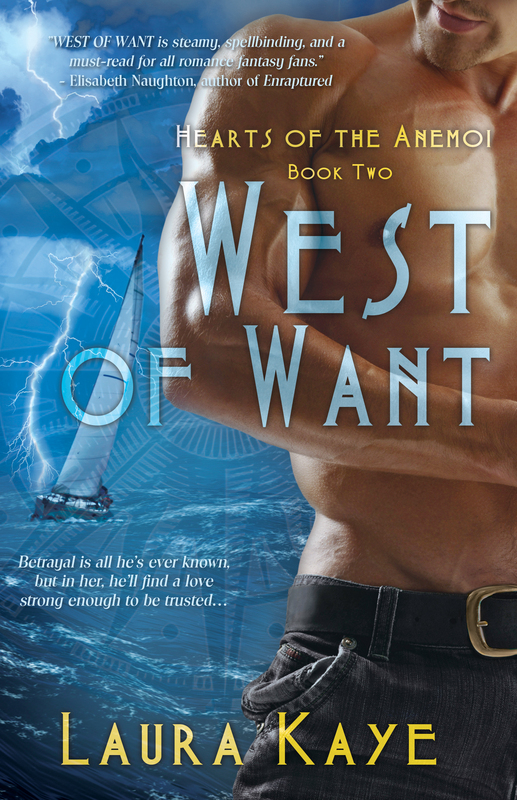 When Zeph’s heartbreak whips up a storm that shipwrecks a human, his guilt forces him to save her. Ella is drawn to the vulnerability Zeph hides beneath his otherworldly masculinity and ancient blue eyes. And her honesty, empathy, and unique, calming influence leave Zeph wanting…everything. When Eurus threatens Ella, she and Zeph struggle to let go of the past, defend their future, and embrace what they most want–a love that can be trusted. A rustling of fabric behind her caught her attention, and she didn’t turn to look, because she knew. He’d taken his jeans off. Her imagination went wild. He was magnificent from the waist up—cut stomach, taut chest, broad shoulders, arms so muscular the veins popped. No way the scenery on the bottom half was any less impressive. If she let her eyes confirm the details, she’d be done for. All over him. Any pretense that this was just about removing bad magic would go right down the drain. Wet denim slapped against the floor. The door slid shut. Instinctively, Ella felt Zeph’s presence behind her. Looming. Promising to touch. Her mind resisted what her body wanted. Ella didn’t do this. She was analytical and levelheaded. While she enjoyed adventure, she wasn’t a risk taker and she wasn’t a by-the-seat-of-her-pants kind of woman. These were traits developed through sailing, traits that made her a good sailor. Recent debacle notwithstanding. She sagged back against him and gasped. He was completely naked. And fully aroused. Oh, my God.